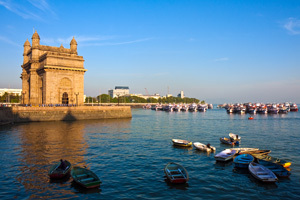 Mumbai - Bombay - is the capital of the Indian state named Maharashtra, it has around 13 million inhabitants. It is the commercial centre of India and a global financial platform. It groups together the Indian cinema and television studios. Its standard of living is quite high compared to other Indian regions. Numerous places are worth a visit including the Hanging Gardens Garden terrace, the magnificent building housing the Chatrapati Shivaji Station, the Prince of Wales Museum, the Gateway of India with its characteristic Indo-Mauritian style, the Flora Fountain in the city centre, and also the Sanjay Gandhi National Park nearby with its panthers and hundreds of bird species and the Elephant Grotto with its 6th Century sculptures. Meander around the markets with their spicy aromatic aromas and vivid colours, full of life and surrounded by people speaking scores of different languages. Pause in the temples, absorb their serenity and observe the rituals. Go on to the beaches of Chowpatty and Juhu, large and very popular. Avoid visiting Bombay between June and September, the hot and humid period of the rainy season which can cause catastrophes at times. For transport around the city, until the Bombay metro is finished it is best to use taxis and rickshaws which are both easy to find and efficient.